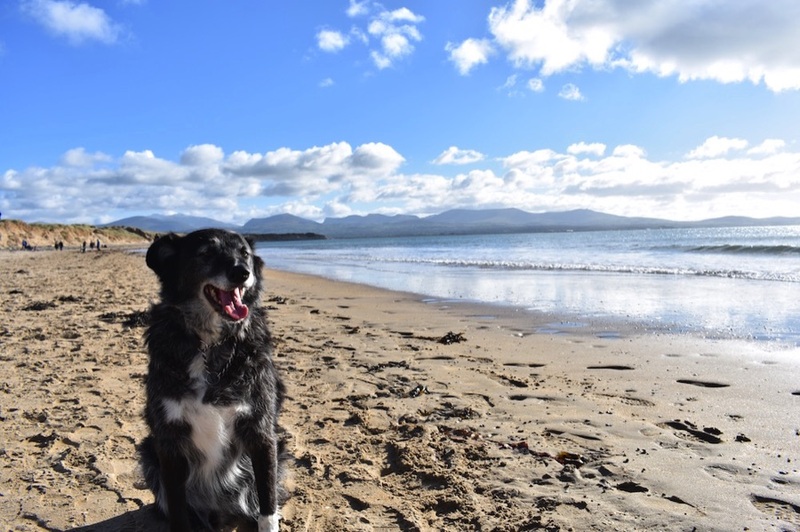 In the first of a new series about dog-friendly breaks, we head to Anglesey in North Wales with our nervous rescue dog, Charlie. Heading away for a few days with the family is so much more fun when everybody gets to come along. But travelling with a dog can create challenges. Being a rescue dog, Charlie is of a nervous disposition. With careful nurturing we have helped him overcome many of his very long list of fears: gravel, the wind in the trees, vans, cardboard boxes, and men wearing fluorescent jackets, to name just a few. Charlie's still afraid of busy environments, traffic and loud noises. So finding activities that suit the whole family takes careful planning. But we all love the beach, and Anglesey has some wonderful beaches – many of which are welcoming to dogs. The Good Dog Guide is a good place to find inspiration – and you should always check that dogs are welcome before setting out for the day. While some beaches welcome dogs year-round, others impose restrictions during certain months. A vast sweep of golden sand backed by thick pine forest, Newborough Beach (also known as Llanddwyn Beach) is a paradise for dogs. On a sunny Sunday morning in autumn, this was evident by the number of dog-walkers enjoying the beach. But although there were a lot of people and pooches, the beach is so huge that it never felt crowded. And with two of Charlie's favourite things in abundance – sand and other dogs – we knew he would have a wonderful morning. 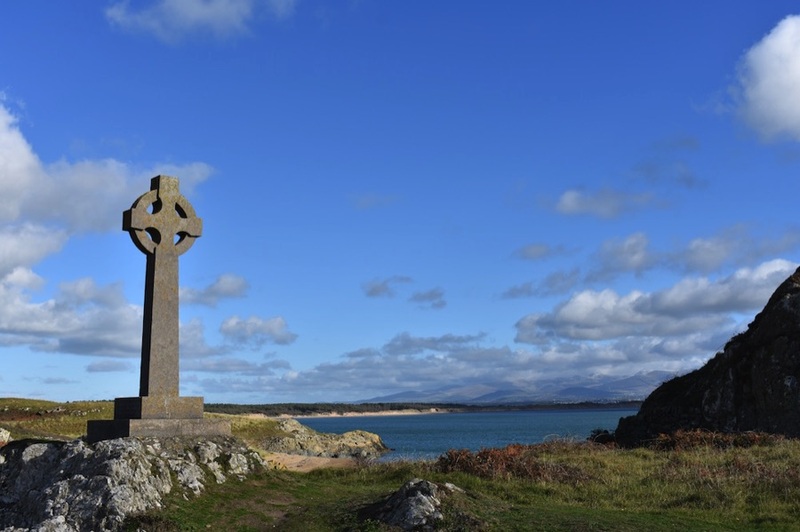 It's a 40-minute walk along the length of Newborough Beach, but at the far end you're rewarded with a cluster of fascinating historic sights on Ynys Llanddwyn (Llanddwyn Island). This narrow finger of land pointing into the sea is home to the ruins of Llanddwyn Chapel, also known as the church of St Dwynwen. St Dwynwen is the Welsh patron saint of lovers, the country's own version of St Valentine. Dwynwen was unlucky in love. So she became a nun, founded a church on the island, and devoted her life to God – praying that other lovers would have better luck than she did. Historically the church was a place of pilgrimage, with visitors drinking from a holy well in the hope of ensuring love and happiness. St Dwynwen's Day – the Welsh St Valentine's Day – is celebrated on 25 January, and is becoming an increasingly popular event, with lovers exchanging cards, gifts and flowers. At the far end of Llanddwyn Island are two stone crosses, a lighthouse, and a picturesque row of whitewashed cottages. 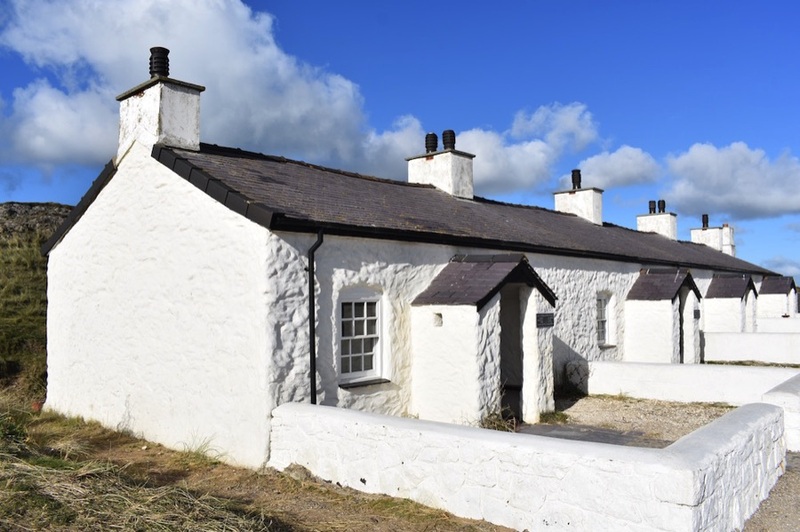 These are the Pilot's Cottages, built to house the pilots who helped boats navigate safely through sandbanks along the Menai Strait. The island is part of the At the far end of Llanddwyn Island are two stone crosses, a lighthouse, and a picturesque row of whitewashed cottages. These are the Pilot's Cottages, built to house the pilots who helped boats navigate safely through sandbanks along the Menai Strait. The island is part of the Newborough Warren National Nature Reserve – an area of dunes, cliffs, mudflats and saltmarshes that supports a wide range of plants, invertebrates and birds. Llandwynn Island is cut off by the sea when the tide is very high, so keep this in mind if you're visiting! And on the walk back to the car park, be sure to enjoy the spectacular views of the mountains of Snowdonia National Park. 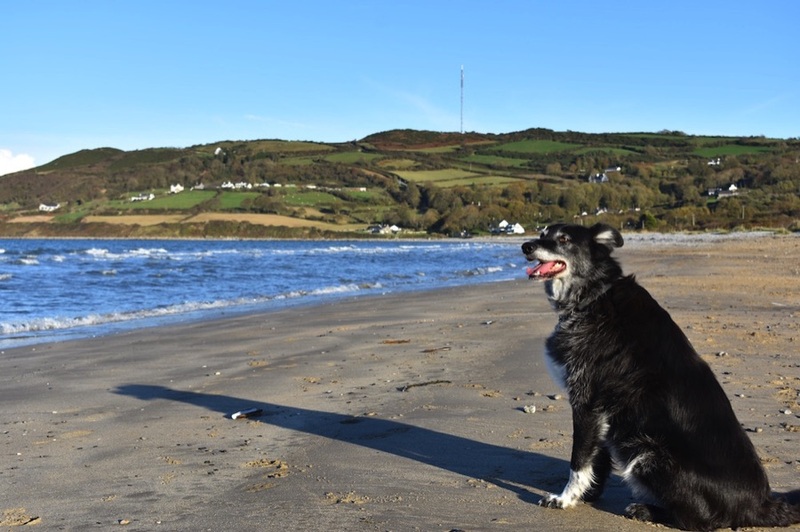 Another beautiful dog-friendly beach can be found at Red Wharf Bay, on the east coast of Anglesey between Benllech and Llanddona. It's quieter and more secluded than Newborough. There's parking right alongside the beach, and a long stretch of sand – perfect for a run. The sea here is quite shallow, so is great for paddling and splashing about in, and there are plenty of wading birds to look out for. 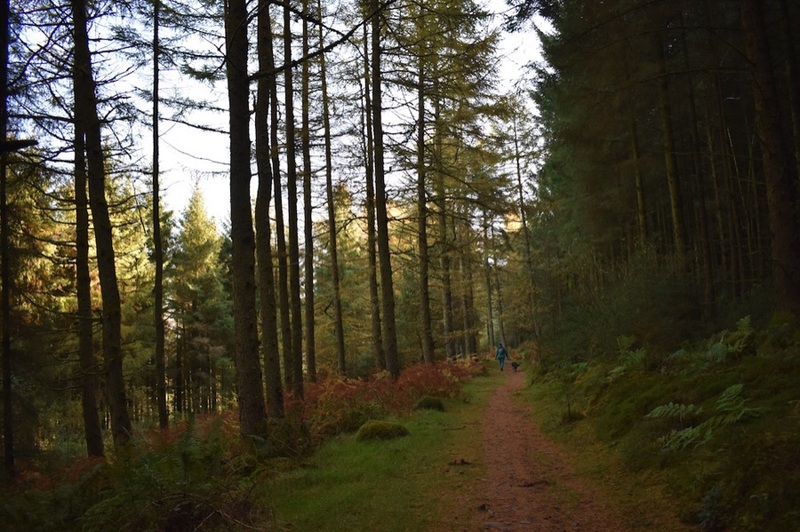 Nearby Pentraeth Forest is a lovely spot for a stroll, and if you walk quietly you may get a glimpse of one of the woodland's resident red squirrels. Sand not your thing? 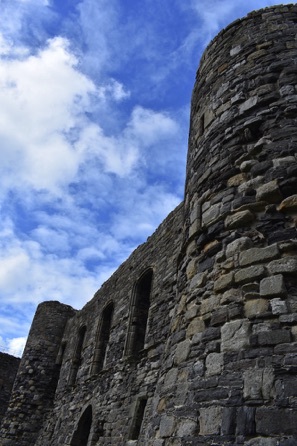 Head for one of Anglesey's fascinating historic sites. 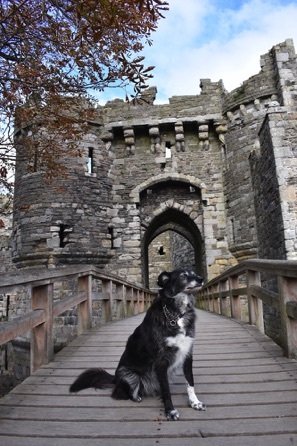 Check out the CADW website for details of where to go and what to see – many of their sites welcome dogs. 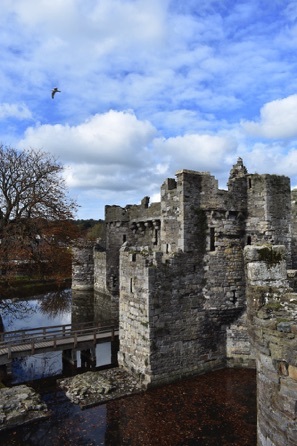 With its imposing towers, wide moat and scenic ramparts, Beaumaris Castle looks as though it's come straight from the pages of a fairytale. Building began in 1295 during the reign of Edward I, with the entire population of the village of Llanfaes forcibly moved 12 miles away to Newborough to make room for the new castle. Edward's plans for the castle were extravagant and expensive. Stonemasons were brought in from all over the country, and huge amounts of money – the equivalent of around £3.75 million today – were thrown at the project. 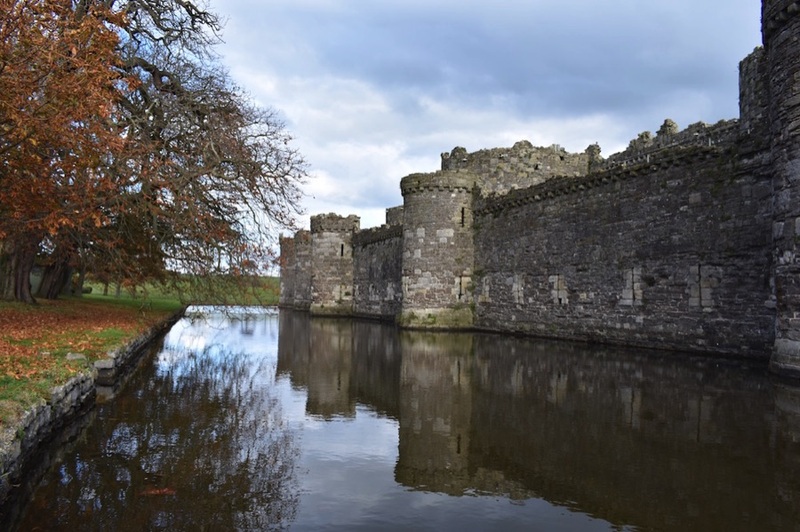 But money and supplies ran out and the castle was never completed – and Beaumaris became known as 'The greatest castle never built'. But despite being incomplete, it's still one of the most impressive and magnificent castles we've visited. We had no problem coaxing Charlie across the wooden bridge into the castle. We thought he would be nervous but he surprised us by pulling ahead eagerly. Inside is a maze of twisting spiral staircases and dimly lit stone corridors. 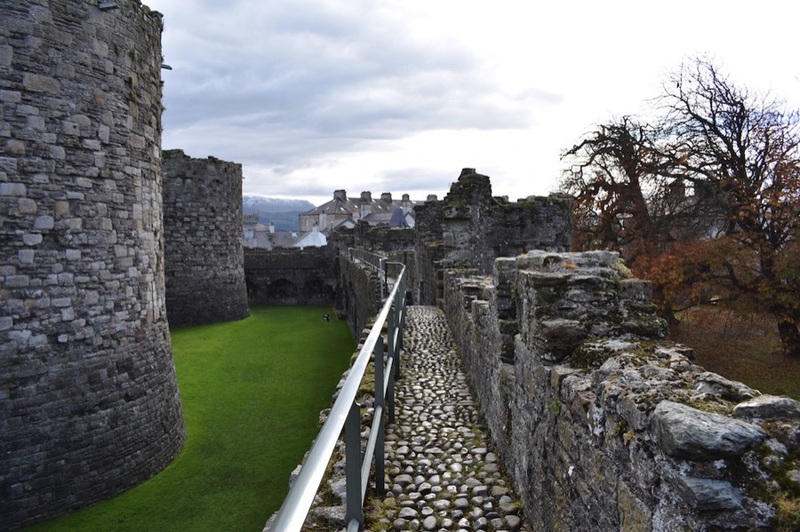 It's hugely atmospheric – and Charlie thoroughly enjoyed exploring all the castle's nooks and crannies. After our visit we headed for The Bulkeley Hotel for lunch. This grand old Grade 1 listed building is in the centre of Beaumaris village, and has glorious views over the Menai Straits. Dogs are welcome in the cosy coffee shop, and water bowls are provided for your four-legged friend. Or you can sit outside at one of the picnic tables. The coffee shop lunch menu includes brunches, sandwiches and jacket potatoes, with vegetarian choices – as well as a range of delicious homemade cakes. Although dogs aren't allowed in the hotel's restaurant or bistro, you can order from the bistro menu and eat in one of the lounge or bar areas. This historic house is owned by the National Trust, and features 40 acres of gardens and 129 acres of woodland and parkland. Dogs on leads are welcome in much of the grounds, but not in the house. 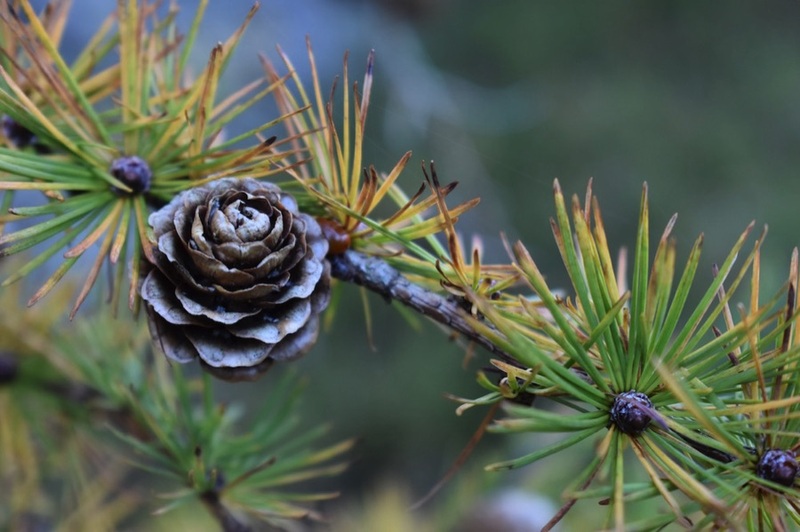 Situated in a stunning location alongside the Menai Straits – with spectacular views across to Snowdonia – the mild conditions here allow a wide range of trees and plants to thrive. 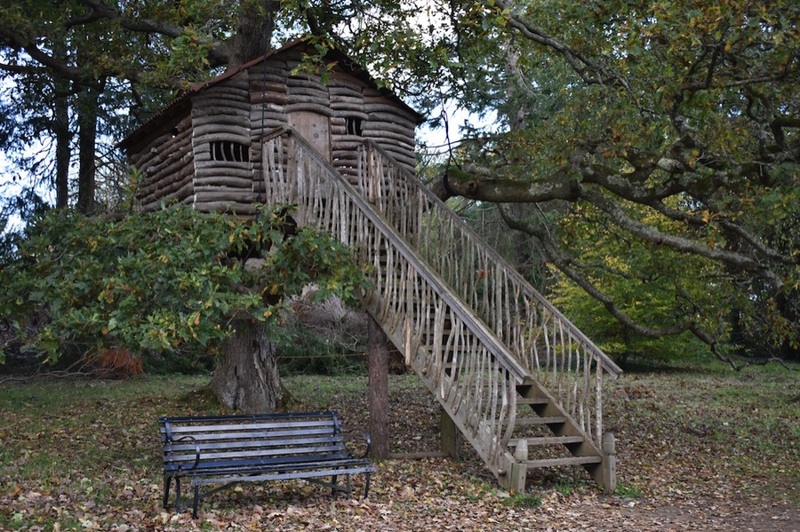 We spotted a red squirrel in the trees – and there's a great treehouse to climb up into. We were also pleased to notice the five-acre wildflower meadow – in the summer this is home to a huge variety of plant, insect and bird life, including four native orchid species. We weren't allowed to take Charlie into the Plas Cafe, but as it was warm and sunny we sat in the beautiful courtyard alongside – an area that's alive and vibrant with colourful flowers and garden birds. If poor weather means you need to sit inside, then the Old Dairy café – near the entrance to the grounds – welcomes dogs on short leads. Not far from Plas Newydd is a small town with a big claim to fame: it has the longest place name in the UK, and the second longest place name in the world (New Zealand's Taumatawhakatangihangakoauauotamateaturipukakapikimaungahoronukupokaiwhenuakitanatahu takes first place). 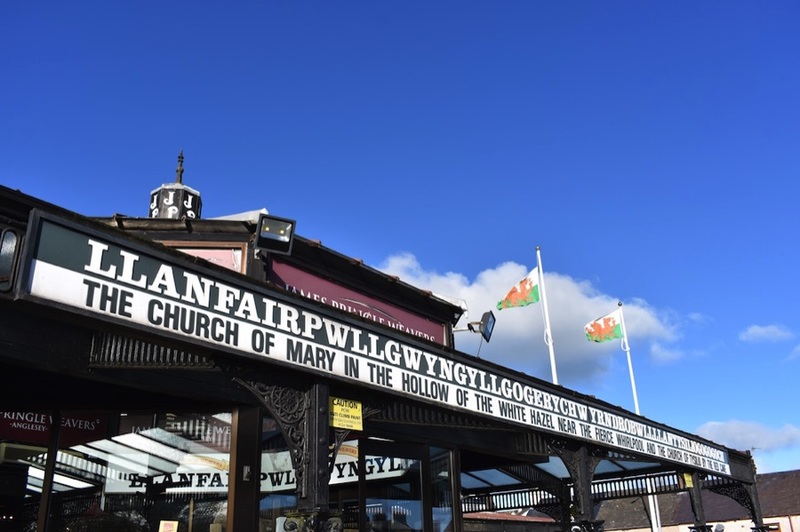 Llanfairpwllgwyngyllgogerychwyrndrobwllllantysiliogogogoch means 'The church of Mary in the hollow of white hazel trees near the fierce whirlpool and the church of Tysilio by the red cave', and we were curious to visit the town – if only to take a photo of the sign at the train station. There's a big touristy shopping centre in the village, where you can buy all things Welsh from toy dragons to carved wooden love spoons. The adjacent farm shop sells local produce – try the traditional Welsh cakes. Dogs aren't allowed in the shopping centre, so Charlie had to wait for us in the car – but after his long walks on the beach and in the woods, he was glad to rest! 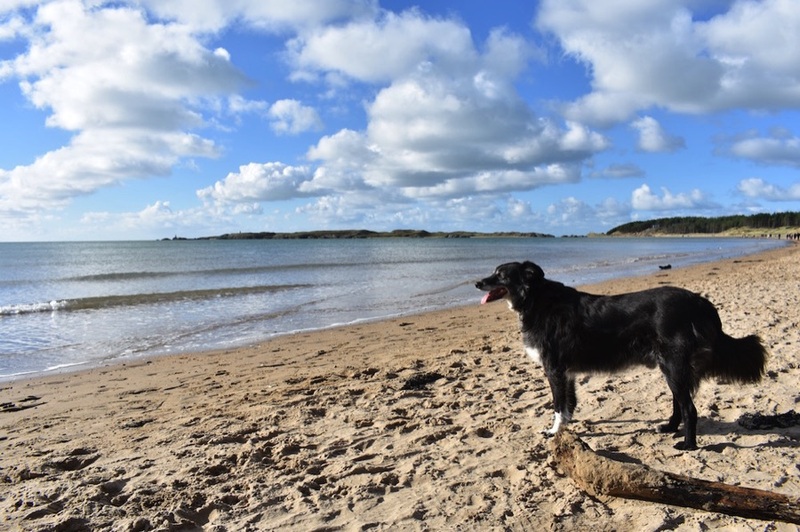 Menai Holiday Cottages has a fantastic range of properties across Anglesey and north Wales – and many of these are dog friendly. 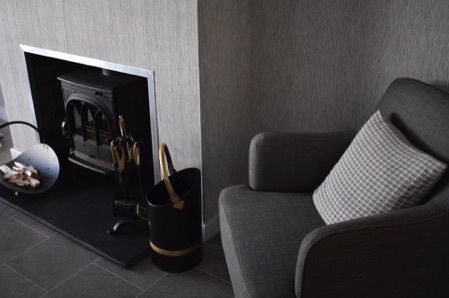 We stayed at a cottage called Frondeg, in the village of Rhiwlas, near Bangor – a spacious two-bedroom bungalow in a convenient location for exploring both Anglesey and Snowdonia. The cottage owners live nearby and have dogs themselves, so the property is designed with pets in mind, with lots of thoughtful extras. There was a large tiled hallway where dogs can dry off, a pile of towels just for Charlie – and alongside our welcome gift of wine and chocolates, a packet of dog treats! The house was spotless, and pleasantly furnished and decorated. There were stunning views from all the rooms. 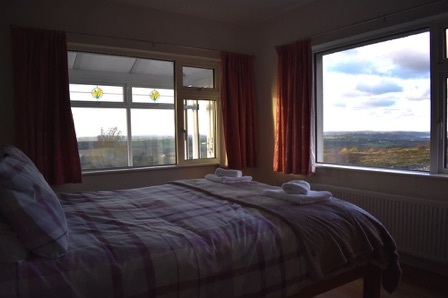 The bedrooms looked out over peaceful farmland towards Penrhyn Castle in the distance, and from the living room and sunroom there was a sweeping vista across the Menai Straits to Anglesey. This view was particularly beautiful at night as the lights along the coast began to shine and the stars came out – there is little light pollution in the area, so the night skies were stunning. Frondeg is at the heart of a network of lovely walking routes, with rural footpaths through gorgeous countryside accessible right from the cottage door. This meant Charlie's morning walk was as much a part of the holiday as our days out, and we explored several of the footpaths during our stay.